I went to a friends house for dinner this weekend and we somehow got onto the subject of organic milk. His wife said, “There aren’t any preservatives in organic milk…it’s organic”. This got me thinking about how the words natural and organic are used and what they actually mean. I’ve been to the shops countless times and picked up something labelled as organic, only to find that the organic ingredient they are referring to makes up less than 1% of the product and the rest is full of nasties. So it is important to remember that natural and organic do not mean the same thing. Natural does not mean organic – products/ingredients can still be of GMO origin and grown with chemical pesticides. For example, the tomato – a natural product, GM origin and sprayed with pesticides. A soup made from this tomato could have “all natural ingredients” on the label, but could not be labeled organic. An organic product does not mean a natural product. For example, it might contain organic lavender, but the rest of the ingredients might be synthetic. Products and ingredients are certified organic by third party organisations to ensure guidelines are strictly adhered to. When shopping for organic products, it’s best to look for those that carry an organic certifications (EcoCert, Soil Assocation etc) as this ensures you are buying products with a genuinely high content of organic ingredients. If you’d like to know more about natural and organic certifications, please visit our labels and certifications section. 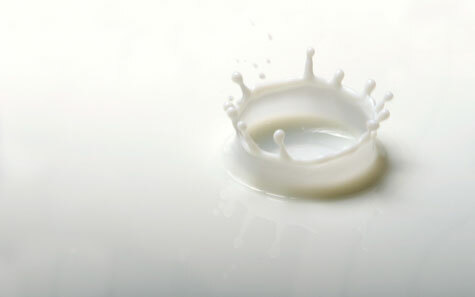 Organic milk is produced without hormones, antibiotics or pesticides. There are different ways of treating it – Pasteurisation (it’s heated to 162 degrees for 15 seconds), UHT (Ultra High Temperature pasteruisation up to 192 degrees)and Homogenisation (the fat is equally dispersed throughout the whole milk. All of these treatments can affect the shelf life of milk, but none of them involve introducing any kind of chemical preservatives into the milk itself. Interesting that in Canada no milk is allowed to contain any antibiotics, artificial growth hormones, pesticides, chemicals or preservatives. I wonder how the UK compares? Thanks for all of that information, very helpful! So could preservatives could be added after the pasteurisation and homogenisation or do these processes ensure preservatives don’t need to be used? Canada also bans some cosmetic ingredients that are still used in other countries around the world. The idea is that pasteurisation and UHT mean that no preservatives are necessary. There’s a school of thought that says even these processes destroy the molecules that make up milk and shouldn’t be used. As ever, it’s going to be a balance between practicality (we don’t all want a cow), commercial interests and consumer power/demand. I only ever buy organic milk now. Can’t see me going back. How about all other milk-variety? The ones that claim that they’re fat-free and such? From the info that I get from this blog they’re not anymore natural since they’re altered already. Can they at least even be organic?